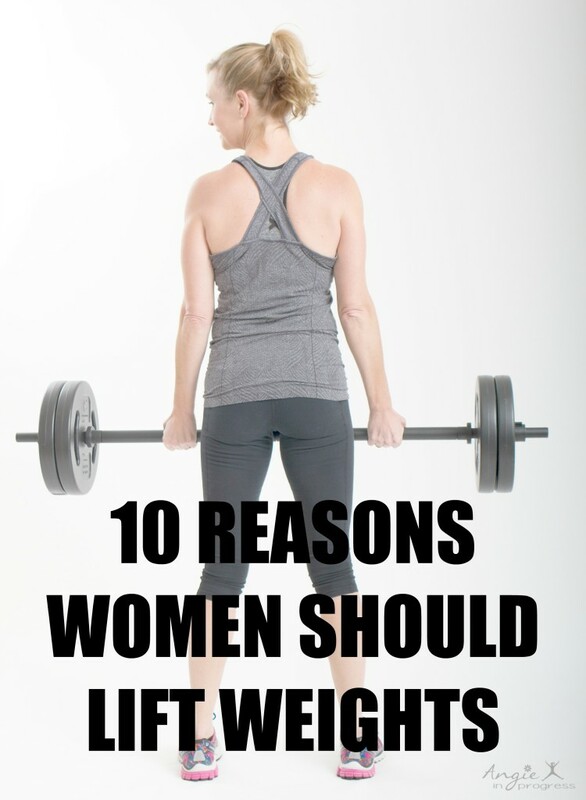 10 Reasons Women Should Lift Weights! I have done so many different types of workouts: cardio, dance cardio, running, kickboxing, yoga, etc…but nothing has ever given me the kind of results that lifting weights has! When I added strength training…I FINALLY saw the kinds of changes in my body that I had always wanted! So I stick with what works, while including some of my other favorite workouts too, of course! I just make sure to lift weights at least 3 times each week. The heavier I lift, the better results I get! I used to be afraid I’d get ‘bulky’, but I was uninformed. The truth is, lifting weights made me leaner and stronger than I had ever been! 1. Burn more fat. It has been scientifically proven that lifting weights keeps your metabolism elevated for several hours after exercise. 2. Change your body shape. You will NOT get bulky! Women lack the body composition and hormones for that! Keep your nutrition clean, and you get leaner and toner and skinny jeans readier! 3. Boost your metabolism. As we get older, we begin to lose muscle tissue, bummer right! If you diet alone, you will lose muscle even faster! Lifting weights will help you build muscle tissue, thus elevating your metabolism, thus burning more calories all day long! 5. Build strong bones. Women MUST lift weights to avoid bone loss! When you lift weights you improve your muscle strength and bone density at the same time! Say NO to hunched over brittle bones! 6. Fight depression. Endorphins are endorphins! Yoga, running, weights…it all makes you feel pretty damn good! 7. Improve sports fitness. Biking, hiking, skiing, whatever strikes your fancy! You’ll be better, stronger and faster! 8. Reduce injuries and arthritis. Your joints, ligaments and tendons will be more flexible and stable. This will help you stay safe! And even those who already arthritis see improved movement and strength with weight training. And less pain too! 9. Get heart healthy. Pumping iron, gets your heart pumping too! A pumping heart, is a strong heart. 10. Defend against diabetes. The more lean muscle mass your body has, the more efficient it is at removing glucose from the bloodstream when can reduce diabetes symptoms and prevent type 2 all together! So now that you have 10 reasons…you just need a plan! When I was first starting out, I didn’t have a clue what to lift, how many times, which days per week, etc…I would aimlessly wander around the gym just looking for things to pick up and put down. Not very effective. When I started P90X it was a relief to have a program that someone else had designed with a purpose in mind. It really takes all of the guesswork out of it for me! I’ve got enough to think about, I don’t have the time to figure out a weight-lifting program, too! And since I got such great results with P90X, I was hooked on the at-home format. I cancelled my gym membership! Next I moved on to Chalean Extreme, Les Mills Pump, Body Beast, and now I cannot wait to start my next program!!! 2 Expert Trainers – 60 Days – Amazing Results! I am SO excited to get started! What is the Master’s Hammer & Chisel? The Master’s Hammer and Chisel is a new resistance-training system that incorporates three muscle-sculpting phases – Stabilization, Strength, and Power – or SSP Training. This is how co-creators and expert trainers, Autumn and Sagi help efficiently build, chisel, and refine a masterpiece physique in just 60 days. 2) Nutrition is based on the proven 21 Day Fix & Fix Extreme Meal Plan, using portion-control containers, with 3 options of different routes to take. You decide what path, depending on your goals. 3) Equipment Recommended: Dumbbells, workout bench OR stability ball, chin-up bar OR resistance band with door attachment (not included in base kit). VIP Test Group Starts January 4th! Get your copy and get in the group that will help you start 2016 lean and chiseled! This month only, you can get the Challenge Pack & Performance Packs are on sale! Save $80! I am ready to commit to the Hammer & Chisel program for 60 days! Previous PostPrevious Black Friday Sales + Last Chance to Get Fix for FREE! Next PostNext Plans for the New Year?